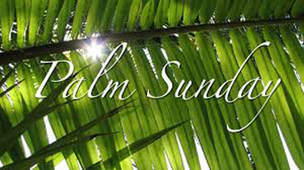 Palm Sunday Worship, 8:00, 9:30, 11:11 a.m., and 6:00 p.m.
Palm Sunday Worship Service, 10:30 a.m. Traditional Worship Services, 8:00 & 11:00 a.m.
Palm Sunday Worship Service, 9:30 a.m.
Palm Sunday Worship Services, 9:00 & 11:00 a.m.
Palm Sunday Worship, 10:00 a.m.
EASTER MUSICAL "The Day He Wore my Crown", 6:00 p.m.
Palm Sunday Worship, 9:00 & 11:00 a.m. Contemporary Sunday Worship, 9:30 a.m.
CAYA (Come As You Are) Sunday Worship Service, 9:05 a.m. Sanctuary Worship Service, 10:55 a.m.
Palm Sunday Worship Services, 8:45 and 11:00 a.m.
Palm Sunday Worship Service, 10:00 a.m.
Service of Pam/Passion Readings and Hymns, 10:30 a.m.